I had a bunch of effects pedals I wasn't using, so I put them on talkbass for sale. My plan was to buy a Tech 21 VT Deluxe, but I found the exact bass I had been wanting in the classifieds before my stuff sold. I made an offer and got it. After all my pedals selling, this baby cost me an extra $15. 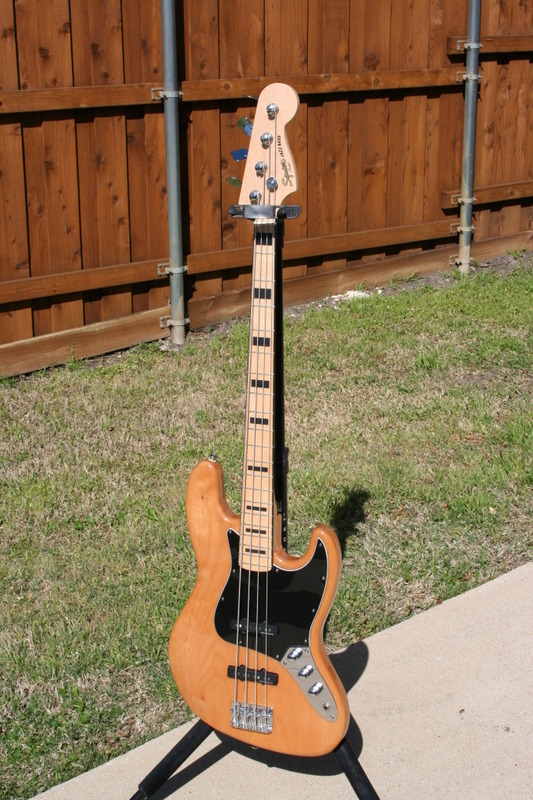 Squier Vintage Modified 70's Jazz in natural maple. It was new in 2010 and doesn't look like it has ever been played. I put new Rotosound 77s (flatwound Jazz) strings on it last night and took it practice today. It sounds incredible and really punchy. Pic is at the following link. Very nice! I like the inlays. I was considering that bass when I bought my Squier and it is really good for the bucket... In your case, obviously, it is extremely good for the bucket! I'm a huge fan of flats. My P-Bass has had the same set of La Bellas on it for 3 years. I had flats on my 5 string Jazz, but put Rotosound rounds on it trying to get mid-rangy punch. But they are just uncomfortable and I get a lot more finger noise and squeaks with the rounds. The Rotosound 77 Jazz Flats sound quite different from the La Bellas (and not just because they are 3 years old ). They are brighter and have more of that snarl the rounds usually have. With the Jazz pickups, I was able to dial in that tone I was wanting. I think I'm going to switch back to the D'Addario flats I had on my 5 string since I have this Jazz now. Cool! Hope you enjoy it as much as I am enjoying mine. I picked up my P-Bass a couple of weeks ago after not playing it for a while and had forgotten how thick the neck was. i love guitar.Love Bee basses and that one is a beauty, congrats! Congrats! This is a very nice bass! Enjoy!